Monika Kinner-Whalen is a full time Saskatchewan fibre artist who lives and works in Saskatoon. 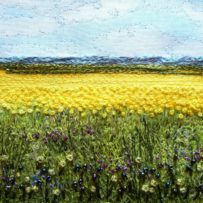 Her creations are expressions of her love of the prairies and often originate from her personal photographs of Saskatchewan. Her creations are stitched by self guided machine sewing and intricate hand embroidery onto cloth. The Ukranian Museum of Canada is hosting a show of her work from October 6, 2018 to February 12, 2019. The Ukranian Museum has one of the largest ethnic textile collections in the diaspora. The work of this artist is a perfect fit with the master embroideries in the museum collection. This is an exhibition not to be missed.